It was a nice short tour to know the surroundings. Really good tour. Marco was excellent! Marko the host was excellent, very knowledgeable, fantastic way to get your bearings on the city, recommend it as soon as you arrive for this reason. Our tour guide, Kosma, was amazing. It was a lot of fun and very informative. A great way to see Rio. Our guide Philip was fantastic. A former journalist, he has excellent knowledge of Rio. We loved his stories. He attended closely to group safety But the number one reason we give you a thumbs up, Philip, is the way you helped us when I ran into trouble with the Rio heat. Philip took care of our bikes and helmets and hailed us a taxi. He was so kind. Philip, you are the best! Guide was helpful and not rushing us! 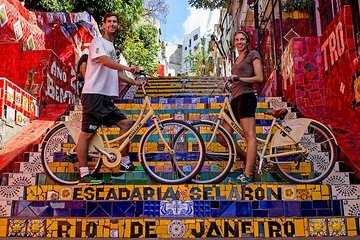 The tour really allowed you to see many spots of the city and I was very impressed with the bike lane constructions of Rio de Janeiro! Marco is doing a very good job and the tour is amazing.